Four months ago I sat down with famed Brazilian jiu jitsu guru and MMA coach John Danaher to talk about our respective hip problems. I had just received a rather dour preliminary diagnosis from my doctor telling me I had femeroacetabular impingement, which in medical terms means there is a bony prominence along the superior aspect of my right and left femoral head/neck junction, in layman’s terms means the top of my thighs bones are slightly misshapen and are rubbing against my hip socket, and in practical terms means I can barely turn my hips over or pivot my feet while doing round Muay Thai, thereby preventing me from kicking properly and breaking my heart. When I heard that Danaher (who has helped coach Georges St-Pierre and Chris Weidman to stellar MMA careers and countless jiu-jitsu players to countless championships) had been suffering for years with debilitating pain and immobility in his knees and hips as a result of congenital defects, botched surgeries, and the onset of osteoarthritis, I knew I needed to talk to him, if only to get a little perspective on my situation, which, though barely worth a mention when compared to what Danaher and hundreds of millions of other people suffer through daily, seemed like the greatest tragedy in the world to me. During our talk, Danaher said that he was just then preparing for surgery to fix his hip problems—either hip resurfacing or full-on hip replacement—and resigning himself to the thought of no jiu-jitsu for up to a year and the possibility, however slight, of never being able to roll again. Just as advertised, Danaher was facing his predicament with an impossible spiritual calm, prepared to face whatever life and the sum total of western medical expertise were going to hand him and keeping an elegant equilibrium and perspective on the relative severity of his problems. I, on the other hand, was wracked by morbid thoughts and given to outbreaks of grumpiness and self-pity. Four months later the update on our two stories is predictable. I put off going to a follow-up visit with an orthopedic surgeon until last week, at which point I was told officially that I have a chronic condition and that short of arthroscopic surgery and six months’ recovery time the best I can hope for with months of physical therapy and multiple cortisone injections is some minor improvement in hip mobility. My doctor essentially told me that life and anatomy had dealt me a particular hand and that I would just have to deal with it. I took this to mean that the gods had cursed me out of childish spite, and I went home that night miserable and hating the world. 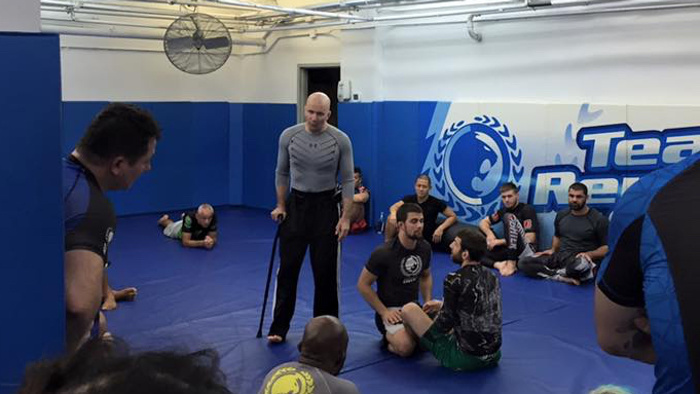 John Danaher meanwhile, went right out and put himself through one of the surgical procedures he’d told me about, and not four weeks later he was back at the gym teaching Four. Weeks. The doctors told him it would be two months before he’d teach again and there he was after one. So much for my fantasy about me and John Danaher working our way through our suffering slowly and together. Yesterday the Gracie Academy posted pictures on Instagram of Danaher teaching his first class back. He’s standing with the help of a cane, unable to get down on the floor to demonstrate the moves himself, and two high-ranked students are there to actually run through the movements, but still, there he is, doing the impossible. Just to make me look bad. Just to rub it in my face, huh, John? After all we’ve been through together? After all we shared? Some guru you turned out to be. But Josh, you’ll protest, you’re looking at this the wrong way. Don’t be mad at John Danaher; be inspired by him. Look what he’s done and just imagine what you—10 years younger and with far-less-severe symptoms—will be able to do if you just set your mind to it. That’s fine, but I wasn’t looking inspiration from John Danaher; I was looking for commiseration. Shared misery. Long tales of woe told over large bottles of whiskey. The joy that can only come from pain you experience with another person. The delight of common despair. You can keep your overcoming and your spiritual clarity and your enlightenment and your oneness with the secret truths of the universe, John Danaher; I’ve got something even deeper and more mystical on my side: I’ve got resignation. I’ve got the purifying power of pure, unfiltered, perfect self-pity.